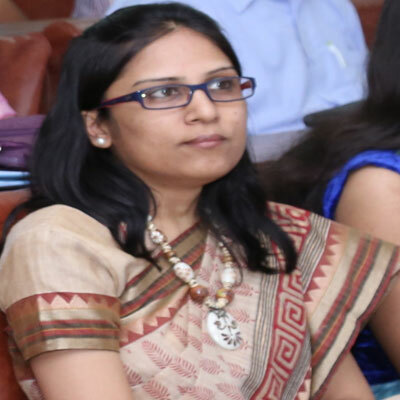 Dr. Vartika Jain is currently working as Lecturer at Government Meera Girls College, Udaipur, India. She has completed her Ph.D. in Botany from Mohan Lal Sukhadia University, Udaipur, India. She is life member of Indian Science Congress, Society for Microvita Research and Integrated Medicine, National Environmental Science Academy, Society of Ethnobotanists, Association for Plant Taxonomy and annual member of International Society of Ethnobiology and International Society for Ethnopharmacology. She is fellow of Society for Microvita Research and Integrated Medicine, and Society of Ethnobotanists. Dr. Vartika has received awards and honors include Young Scientist Award, Gold Medal for standing First in Mohanlal Sukhadia University in M.Sc. examination, Maharana Fateh Singh Award in 1999 for class XII results by Maharana Mewar Foundation, Udaipur, and Inclusion of biodata in Mahila Gaurav Kosh-II, Published by Mahila Samaj Society. She is member of editorial board in Journal of Medicinal Plant Research, African Journal of Microbiology Research, Philippine Agricultural Scientist, Bulletin on Microvita Research and Integrated Medicine, Abstract book of International Conference on Folk and Herbal Medicine. She has published 38 research articles in journals contributed as author/co-author. Verma, S.K. and V. Jain, 2018. Chapter 11: Elettaria cardamomum (L.) Maton (Small Cardamom)- A Dietary Spice with Antihypertensive Potential and Added Cardiovascular Benefits. In: Recent Progress in Medicinal Plants, Vol. 48, Metabolic disorders: Hypertension, Govil, J.N. and A. Bhardwaj, (Eds.) Studium Press LLC, USA, ISBN: 1-62699-085-9, pp: 189-206. Jain, V., 2018. Chapter 21: Bombax ceiba L.(Semal)-A Multidimensional Folk Medicinal Tree. In: Advances in Ethnobotany, Jha, S.K. (Ed.) Satish Serial Publishing House, New Delhi, pp: 401-410, ISBN: 978-9386200273,. Jain, V. and S.K. Jain, 2018. Dictionary of Local-Botanical Names in Indian Folk Life (Guide to over 26000 Tribal and Rural Plant Names Documented in Sixty Years Ethnobotanical Field Work). Scientific Publishers, Jodhpur, ISBN: 978-93-83692-51-4, Pages: 329. Jain, V. and K. Tak, 2018. City beautification-A modern threat to biodiversity. Bull. Microvita Res. Integrated Med., 10: 8-10. Vartika, J., 2017. Ethno-biology of exhibits in a mega handicraft fair of Rajasthan. Indian J. Tradit. Knowledge, 16: 524-532. Jain, V., 2017. Semal: A tree of multifarious importance. Royal Harbinger, Vol. 3. .
Jain, V., 2017. Chapter 5.4: Etymology and Utility of Local Plant Names. In: Methods and Approaches in Ethnobotany (Concepts, Practices and Prospects), Jain, S.K. and V. Jain, (Eds.) Deep Publications, New Delhi, pp: 168-170,. Jain, V., 2017. Chapter 5.1: A Glimpse of Culture-Based Man-Plant Relationships in Indian Folk Life. In: Methods and Approaches in Ethnobotany (Concepts, Practices and Prospects), Jain, S.K. and V. Jain, (Eds.) Deep Publications, New Delhi, pp: 151-157. Jain, V., 2017. Chapter 3.5: Quantitative Ethnobotany. In: Methods and Approaches in Ethnobotany (Concepts, Practices and Prospects). Jain, S.K. and V. Jain, (Eds.) Deep Publications, New Delhi, pp: 104-109,. Jain, V., 2017. Chapter 2.3: Ethnobotanical Uses of Some Plants in India. In: Methods and Approaches in Ethnobotany (Concepts, Practices and Prospects), Jain, S.K. and V. Jain, (Eds), Deep Publications, New Delhi, . Jain, V., 2017. A bibliographic overview of Dr. S. K. Jain’s research work on taxonomy and phytogeography. Phytotaxonomy., 17: 136-145. Jain, V., 2017. A bibliographic overview of Dr. S. K. Jain’s research work on Ethnobotany. Ethnobotany, 29: 99-109. Jain, V., 2017. Chapter 4.1: A Glimpse of Need-based Man-plant Relationships in Indian Folk Life. In: Methods and Approaches in Ethnobotany (Concepts, Practices and Prospects), Jain, S.K. and V. Jain, (Eds.). Deep Publications, New Delhi, pp: 137-142. Jain, V. and S.K. Verma, 2017. Indigenous artificial limb of Bombax ceiba L. wood-A novel ethnobotanical use. J. Tradit. Folk Pract., 5: 142-147. Jain, V. and S.K. Jain, 2017. Dictionary of Local to Botanical Names of Plants in Indian Folk Life (Guide to over 26000 Tribal and Rural Plant Names Documented in Sixty Years Ethnobotanical Field Work). Scientific Publishers, Jodhpur. Jain, S.K. and V. Jain, 2017. Notable Indian herbaria for identification of ethnobotanical collections. Ethnobotany, 29: 82-88. Jain, S.K. and V. Jain, 2017. Methods and Approaches in Ethnobotany (Concepts, Practices and Prospects). Deep Publications, New Delhi, ISBN: 978-93-80702-124, Pages: 211..
Jain, S.K. and V. Jain, 2017. Chapter 1.1: Ethnobotany: The Five Ws?. In: Methods and Approaches in Ethnobotany (Concepts, Practices and Prospects), Jain, S.K. and V. Jain, (Eds.). Deep Publications, New Delhi, pp: 7-9. Verma, S.K. and V. Jain, 2016. Elettaria cardamomum (L.) Maton (Small Cardamom): A Dietary Spice with Antihypertensive Potential and Added Cardiovascular Benefits. In: Metabolic Disorders, Govil, J.N., V.K. Singh and N.T. Siddiqui (Eds.). Studium Press, USA. Jain, V., 2016. Ethno-biology of exhibits in a mega handicraft fair of Rajasthan. Indian J. Tradit. Knowledge (In Press). .
Jain, V., 2016. Candy of Cannabis sativa L.: A traditional intoxicant in Udaipur, Rajasthan. J. Trad. Folk Pract., 4: 129-131. Jain, V., 2016. A contribution to the etymology of some Sanskrit names of a majestic tree Bombax ceiba L. Phytotaxonomy, 16: 135-137. Jain, V., 2016. Psychic pabula, imperialism and microvita in view of Sarkar's microvitology. Bull. Microvita Res. Integr. Med., 8: 10-10. Jain, V. and S.K. Verma, 2016. Folkloric use of plants for treatment of epilepsy in India. J. Trad. Folk Pract., 2: 120-134. Jain, V. and S.K. Jain, 2016. Compendium of Indian Folk Medicine and Ethnobotany (1991-2015). Deep Publications, New Delhi. Jain, V. and S.K. Jain, 2016. Beta Ethnobotany: Some new directions. Ethnobotany, 28: 124-127. Verma, S.K. and V. Jain, 2015. Some less known facts about medical therapeutic systems. Bull. Microvita Res. Integr. Med., 7: 44-47. Jain, V., M. Nath, N. Chauhan and S.K. Jain, 2015. Taxonomic and phytogeographic aspects of plants of Indian puranas. Phytotaxonomy, 15: 152-165. Jain, V., 2015. Some less known ethnobotanical uses of plants in Dungarpur, Rajasthan. Tribe, 47: 88-93. Jain, V., 2015. Popular Sacred Plants in Prabhat samgiita. In: Indian Ethnobotany: Emerging Trends, Jain, A. (Ed.). Scientific Publishers, Jodhpur, pp: 181-194. Jain, V., 2015. Biodiversity conservation practices in Indian mythology. PCAP, 3: 8-10. Jain, V., 2015. Prabhat samgiita: Some folk-cultural aspects. Ethnobotany, 27: 108-113, (In Hindi). Jain, V. and S. Nayaka, 2015. Use of Some of the Lichen Species as Spices in Dungarpur, Rajasthan. In: Recent Advances in Ethnobotany. Kumar, S., (Ed.). Deep Publications, New Delhi, India, pp: 57-60. Jain, S.K. and V. Jain, 2015. Evolution of ethnobotany in last six decades in India: An overview. Ethnobotany, 27: 1-6. Dash, S.S., V. Jain and S.K. Jain, 2015. Notable name changes in plants of Indian Puranas. Nelumbo, 57: 82-85. Verma, S.K., A. Rana and V. Jain, 2014. Virophages- a new world of viruses. Bull. Microvita Res. Integrat. Med., 6: 11-12. Singhvi, A. and V. Jain, 2014. Adansonia digitata L.-A medicinal tree with promising future in India. Bull. Microvita Res. Integrat. Med., 6: 38-40. Jain, V., 2014. A note on an abnormal flower of Bombax ceiba L. Phytotaxonomy, 14: 164-165. Jain, V. and S.K. Verma, 2014. Neo-humanistic exploration: Pala'sh tree in prabha't samgiita. PROUT, 25: 40-43. Jain, V. and S.K. Verma, 2014. Assessment of credibility of some folk medicinal claims on Bombax ceiba L. Indian J. Trad. Knowledge, 13: 87-94. Jain, A. and V. Jain, 2014. A synopsis of some name changes in plants of Rajasthan, India. Bull. Microvita Res. Integrat. Med., 6: 29-31. Bhatia, S. and V. Jain, 2014. Enumeration of grasses in Dungarpur forest range in Rajasthan. Int. J. Environ. Sci., 5: 227-230. Jain, V., 2013. Water crisis- problem and possible solutions. NESA Newsl., 16: 3-3. Jain, V., 2013. Traditional subsistence grains of the poor now health foods of the rich. Ethnobotany, 25: 109-114. Jain, V., 2013. Historical footsteps in search of Viruses. Bull. Microvita Res. Integrat. Med., 5: 3-4. Jain, V. and S.K. Verma, 2013. Plants in prabhat samgiita. Bull. Microvita Res. Integrat. Med., 5: 7-15. Verma, S.K., V. Jain and D.P. Singh, 2012. Effect of Greater cardamom (Amomum subulatum Roxb.) on blood lipids, fibrinolysis and total antioxidant status in patients with ischemic heart disease. Asian Pacific J. Trop. Dis., 2: S739-S743. Verma, S.K., V. Jain and D.P. Singh, 2012. Effect of Pueraria tuberose DC. (Indian Kudzu) on blood pressure, fibrinolysis and oxidative stress in patients with stage 1 hypertension. Pak. J. Biol. Sci., 15: 742-747. Verma, S.K. and V. Jain, 2012. Lymph-the essence of life. BOMRIM, 4: 2-7. Jain, V., S.S. Katewa and S.K. Verma, 2012. In vitro Antimicrobial Activity of Roots of Bombax ceiba Linn. : An Ethnomedicinal Plant. In: Folk Herbal Medicine and Drug Discovery, Katewa, S.S. (Ed.). Scientific Publishers, Jodhpur, pp: 134-140. Jain, V., S.K. Verma and S.S. Katewa, 2012. Effect of Bombax ceiba root on some cardiovascular risk parameters in patients with ischemic heart disease. Asian J. Biol. Sci., 5: 351-357. Jain, V., 2012. Bombax ceiba (Semal) in Indian folklore and traditions. Ethnobotany, 24: 79-82. Jain, V. and S.K. Verma, 2012. Pharmacology of Bombax Ceiba Linn. Springer, Heidelberg, Pages: 94. Jain, V. and S.K. Verma, 2012. Pharmacology of Bombax ceiba Linn. Springer, Heidelberg, Germany, ISBN- 9783642279034. Jain, V. and P.C. Jain, 2012. Rain water harvesting- need of the hour. NESA Newsl., 15: 3-3. Verma, S.K., V. Jain and S.S. Katewa, 2011. Anabolic effect of Bombax ceiba root in idiopathic involuntary weight loss-a case study. J. Herbal Med. Toxicol., 5: 1-5. Jain, V., S.K. Verma, S.K. Sharma and S.S. Katewa, 2011. Bombax ceiba Linn.-As an umbrella tree species in forests of southern Rajasthan, India. Res. J. Environ. Sci., 5: 722-729. Jain, V., S.K. Verma and S.S. Katewa, 2011. Free radical scavenging property of Ipomoea digitata Linn. tuber. J. Herbal Med. Toxicol., 5: 137-143. Jain, V., S.K. Verma and S.S. Katewa, 2011. Free radical scavenging property of Bombax ceiba root. Res. J. Med. Plant, 5: 462-470. Jain, V., 2011. Solar cooker: Simplifying working women`s life. Udaipur plus. Times India, 4: 3-3. Jain, A., S.S. Katewa, S.K. Sharma, P.K. Galav and V. Jain, 2011. Snake-lore and indigenous snake-bite remedies practiced by some tribals of Rajasthan, India. Indian J. Trad. Knowledge, 10: 258-268. Verma, S.K., V. Rajeevan, A. Bordia and V. Jain, 2010. Greater cardamom (Amomum subulatum Roxb. )-A cardio-adaptogen against physical stress. J. Herb. Med. Toxicol., 4: 55-58. Verma, S.K., D.K. Verma and V. Jain, 2010. Homoeopathy-an art of dilution and science of healing. J. Herbal Med. Toxicol., 4: 83-88. Jain, V., S.K. Verma and S.S. Katewa, 2010. Therapeutic validation of Ipomoea digitata tuber (Ksheervidari) for its effect on cardio vascular risk parameters. Indian J. Tradit. Knowledge, 10: 617-623. Jain, V., 2010. Little steps to save environment- role of common man. NESA Newsl., 13: 2-4. Verma, S.K., V. Jain, A. Vyas and D.P. Singh, 2009. Protection against stress induced myocardial ischemia by Indian Kudzu (Pueraria tuberosa): A case study. J. Herbal Med. Toxicol., 3: 59-63. Verma, S.K., V. Jain and S.S. Katewa, 2009. Blood pressure lowering, fibrinolysis enhancing and antioxidant activities of cardamom (Elettaria cardamomum). Indian J. Biochem. Biophys., 46: 503-506. Verma, S.K., V. Jain and A. Vyas, 2009. Fibrinolysis enhancement by Pueraria tuberosa (Indian Kudzu) in patients with coronary artery disease: A placebo controlled study. J. Cell Tissue Res. 9: 1649-1654. Verma, S.K. and V. Jain, 2009. Disease production- virus or microvitum? Prout, 20: 22-25. Jain, V., S.K. Verma and S.S. Katewa, 2009. Myths, traditions and fate of multipurpose Bombax ceiba L.: An appraisal. Indian J. Trad. Knowledge, 8: 638-644. Jain, V., 2009. Solar cooker: A must for every sunny house. A boon for farm lady and working women. Prout, 20: 29-30. Jain, P.C. and V. Jain, 2009. Water insurance-need of the hour. Prout, 20: 21-22. Bordia, A., S.K. Verma and V. Jain, 2009. Studies on the Beneficial effects of Functional Foods Like Garlic, Ginger, Fenugreek and Amla with Special Reference to Ischemic Heart Disease. In: Role of Dietary Fibres and Nutraceuticals in Preventing Diseases, Augusti, K.T. (Ed.). Pharmamed Press, Hyderabad, pp: 313-326. Bordia, A., S.K. Verma and V. Jain, 2009. Chapter 6.4: Studies on the Beneficial Effects of Functional Foods Like Garlic, Ginger, Fenugreek and Amla with Special Reference to Ischemic Heart Disease. In: Role of Dietary Fibers and Nutraceuticals in Preventing Diseases, Augusti, K.T., P. Faizal, K. Suneesh, P. Augustine and R. Jose, (Eds.) Pharmamed Press, Hyderabad, ISBN: 9788188449726, pp: 313-326. Verma, S.K., V. Jain and S.S. Katewa, 2008. Potential antihyperglycemic activity of Bombax ceiba in type 2 diabetes. Int. J. Pharmacol. Biol. Sci., 2: 79-86. Verma, S.K., V. Jain and D. Verma, 2008. Garlic-The spice of life: Composition, cooking, chemistry and preparations. J. Herbal Med. Toxicol., 2: 21-28. Verma, S.K. and V. Jain, 2008. Silk cotton tree in flames and fumes of tradition. Prout, 19: 18-19. Jain, V. and S.K. Verma, 2008. Conservation of silk cotton tree. Prout, 19: 22-23. Verma, S.K., V. Jain, D. Verma and R. Khamesara, 2007. Hawthorn: An old herbal heart remedy-reinvestigated. Int. J. Pharmacol. Biol Sci., 1: 5-15. Verma, S.K., V. Jain, D. Verma and R. Khamesara, 2007. Crataegus oxyacantha-A cardioprotective herb. J. Herbal Med. Toxicol., 1: 65-71. Verma, S.K., V. Jain and S.S. Katewa, 2007. Cardamom lowers blood pressure and enhances fibrinolysis in hypertensive individuals. South Asian J. Prevent. Cardiol., 11: 183-192. Verma, S.K., D. Verma, V. Jain and A. Bordia, 2007. Evaluation of a herbal homeopathic formulation in angina pectoris. J. Herbal Med. Toxicol., 1: 5-9. Verma, S.K. and V. Jain, 2007. Amelioration of pain by acupuncture: Has the mystery been solved. Antiseptic, 104: 80-83. Jain, V., S.K. Verma and S.S. Katewa, 2007. A dogmatic tradition posing threat to Bombax ceiba: The Indian Red Kapok tree. Med. Plant Conserv., 13: 12-15. Verma, S.K., V. Jain and S.S. Katewa, 2006. Urgent need for conservation of silk cotton tree (Bombax ceiba)-a plant of ethno medicinal importance. Bull. Biol. Sci., 4: 81-84. Verma, S.K., V. Jain and S.S. Katewa, 2006. Fibrinolysis enhancement by Bombax ceiba: A new property of an old plant. South Asian J. Prev. Cardiol., 10: 212-219. Verma, S.K., M. Rathore and V. Jain, 2006. Good garlic, bad Breath-adverse effects, toxicity and drug interactions: A review. Adv. Pharmacol. Toxicol., 7: 47-56.